Ismaïl Bahri : "Un espace pour voir"
Lettre d'Olivier Marboeuf à Ismaïl Bahri : "Avoir lieu"
A letter from Ismaïl Bahri to Cécile Poblon (director of the BBB art center in Toulouse) and Olivier Marboeuf (director of the Espace Khiasma in Les Lilas) as part of the development of the artist’s monographic exhibition, which will be presented in September at the Espace Khiasma and on the occasion of two Phantom Mondays: April 10th at the Magin Cinema in Bobigny and April 14th at the Espace Khiasma in Les Lilas. Before we meet again for the next Phantom Monday, here are a few notes on the latest elements I’ve been thinking of. I’ve added a few sketches from my notebooks, as well as an excerpt from lecture notes. The first room will be large and in semi-obscurity. The videos projected here will show windows of different sizes. Openings onto one or several spaces. Onto elsewhere(s) difficult to describe. It will be a minimalist viewing room where we will see an elementary installation, reduced to an almost abstract dimension, not to say Suprematist. Simple dark squares—in the same tone as the projection wall—that float and allow infinitely small openings of light to pierce through. The title will be Percées (Apertures, or Openings). Sketches. The projection of Percées could also be envisaged on the scale of a wall or a movable partition. The space would create a sort of large optical chamber, with the wall or partition functioning as a shutter. Alternatively, the wall-shutter opens and closes, sometimes allowing light to pass through and sometimes obstructing it and becoming a simple wall again. On an architectural scale, a cinematic-photographic mechanics is convoked, with its intrinsic elements: screen, shadow, apparition and mechanical palpitation. When the spectators enter the exhibition, they will penetrate into obscurity, in order to be exposed to lights (both to the interstitial lights emanating from the apertures as well as the continuous light of the video projectors). The exhibition project revolves around the functioning of elementary things transformed into sensitive intercessors. It also activates the elements—essentially, the wind—invoking them as vectors of circulation and dissipation of matter. Light, emanating from tiny chinks in the walls—whether real or fictive (as much as illusory? )—penetrates the room. These infiltrations are sometimes very minimal and reveal little. The apertures of light sometimes disappear. I would like to find a way to give the impression that what is activated is very simple. I’d also like to reserve an important place for the site’s ‘breathing’, in particular at the level of its architectural limits. A common denominator in my current research: palpitation, which rhythms the circulation of the elements. This palpitation is found in the luminous flashing and slight trembling of surfaces and membranes. The palpitations are temporal markers. Through the intermittent rhythm of the flashing, they play on the interval that separates the apparition and disappearance of two images, two events, alternating what is revealed and what escapes from the audience’s view. The physical limits of the exhibition site will be treated in such a way as to create diverse spaces for passages (movements) and projections. The idea of the opening, or aperture, touches on this. It carries in itself the idea of the ‘opening’ as a breach that allows an infiltration from outside. The light that filters through and the motifs that are filmed evoke the existence of the ‘hors-champ’, or ‘out-of-range’. This ‘hors-champ’ is multiple and imagined. 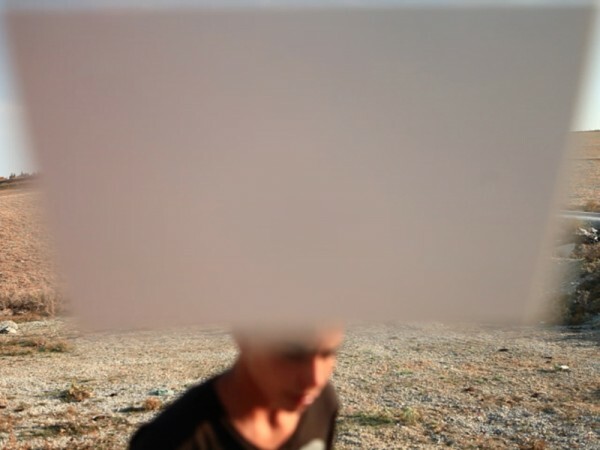 The landscape that can be perceived behind the paper mask remains vague and distant. A body? Several bodies? A crowd? A city? A natural landscape? Another country? It’s possible to retain certain signs or indications of the place and its geography, but this Elsewhere should emerge as somehow troubling to the viewer. And here we come to an element that I find essential: breath. Coming and going, opening and closing, pulsations. Matter pulsates, the walls unfold and vibrate, their movement indicating a current of air. Reviewing the rushes to be used for Percées, it came to me that the black ‘cache’, or mask, is a sort of shadow falling across the image and ‘clothing’ it in a haunting. This shadow soon made me think of a ghost, but later I felt I could understand its true nature. The shadow convokes the ‘hors-champ’ of the image, into the image itself: in other words, the viewing room, plunged into darkness1. As if the obscurity of the “cinema” contaminated the image at its center, covering it almost entirely, allowing only tiny chinks of light to pierce through. A bit in the manner of an internal parasite, or black hole. Eclipses seems to be the logical flip side to Percées. In the same way the screen is the companion piece to darkness. Each of these experiences is the complementary reverse of the other. Eclipses is the projected light of Percées and Percées is the projected shadow of Eclipses. And the title of each of these pieces convokes its double. Percées indicates light while Eclipses presupposes shadow. In this sense, using dark masks is a means of having recourse to negatives of lights, to sensitized surfaces burned by light. Conversely, using white masks is similar to exploring the excess of light, the over exposition of the image. On my last trip to Tunisia, I returned to Demna, to the place where I filmed the adolescents last summer. The landscape had become green and the ground muddy. I returned several times to roam around the small dilapidated and graffiti-ed building that we see in the rushes from the summer. I still don’t really know why, but this site attracts me. Going back again and again, I began to note certain rituals. The school bus passes by two times every morning, a tank truck travels through twice, to make a U-turn. The building is used as a bus stop and the residents of the village stand in its shadows to protect themselves from the sun. The people I met told me that the structure is going to be turned into a real bus stop, when the route is repaved. I’d noticed the first indications of a work site in preparation: a pile of gravel, traces of a backhoe in the mud. There’s a risk that the landscape will be drastically transformed. I wander around this site, even as I am haunted by another site: the Espace Khiasma. Each of these spaces becomes the projection of the other. I feel as if this spacing/rapprochement will be a central element in the exhibition I’m preparing. Olivier, at the last Phantom Monday, you spoke of fabulation. There was a question of the fabulation of sites, the fabulation of Tunisia as the sensitive entanglement of spaces, bodies, atmospheric and mnemonic elements. And that is true. But the exhibition project will also be created around the potential decanting between the Espace Khiasma and these projected spaces. With the screen functioning as hinge, each of these spaces encounters a reverse side, another site. I’ve made editing tests with the rushes from Eclipses. The editing work has the particularity of depending directly on the elements: light, wind…the ghostly things that traverse the range of the camera and contaminate the internal construction of the film. Eclipses could generate a series of short videos, to be seen in a loop, with no identifiable beginning or end. Each of these videos would try to encapsulate a bubble of time, a certain light, a certain wind, encounters; what happens. Each would be the beginning of a film, the beginning of a potential narrative. But they would go no further than that—limited to few minutes, a few pulses—a beginning, no more. Generally, the ellipsis serves as a way to bypass dead times, to jump from event to event. Here, the ellipse becomes the crux of the film, with its lengths, its latencies and perpetual beginnings. With the recourse of editing, I hope to abandon the several screen format that I had originally planned on. I would like show these little films on plexiglass screens that float in space. These screens would be of middling size (approximately 60 cm wide). Translucent and two-sided, they would echo the idea of a hinge pivoting in space. The projection can play on the idea of wall surface/screen—to think of the exhibition in terms of the potential (and magical) transformations of the site. With the idea that the exhibition could change our perception of the space. I’d like to imagine the screens to be trembling and the blank films as the sensitive fabrication of spaces—as in the organization of segments of shadow and light, of holes, chinks, openings, closings. To remove certain partitions and add others, to create gaps, reveal doors and windows, or to hide others in certain cases. A plethora of openings towards other possibilities: to sensitize the viewer, through the reformulation of the space, to the question of potential ‘hors-champs’. To a lesser extent, there is also the idea of creating an ‘hors-champ’ of the cinema itself, “that obscure part of the field” as Jean-Louis Comolli described it. I would have to fabricate darkness, shadows, with their angles, corners and textures2. “What’s happening at the edges constitutes the exact place where seeing occurs.”4 Reading these words I remember what Martine Markovitz said at a Phantom Monday, watching Film à blanc: “you see nothing”. The suppression of the negative expresses well the idea of an emptiness placed at the center. White, or the blank of an absence of images, acquires a centripetal force. But I have the impression it is also what is projected onto the edges. Paradox of a central emptiness that consumes as much as it pushes out towards the edges. George Didi-Huberman sees in the work of James Turell the “littoral, (or coastal) conditions of the visual experience”, a “sight from the edges” or “borderline”. A littoral vision: what might that be? According to Truman Capote, Gauguin, Van Gogh and Renoir must have used black mirrors (or Claude glasses) to “refresh their vision”, to “renew their reaction to color and tonal varieties. After long periods of work, they rested their tired eyes by looking at these black mirrors.”5 It’s at this junction that the video Orientations intersects with the experience of Film à blanc. The black mirror, which shows us “the light of an eclipse”, rests us from seeing and convokes the intuition of a peripheral visual search. Exploring a city with your eyes gazing into a black mirror, just like filming an eclipse of sight, would be like focusing on such moments of visual refreshment, sliding into the shadow of rest. Blinking one’s eyelids creates fleeting apertures. Apparently, it is the body’s softest contact. I recall what Simon Quéheillard said about Eclipses: “I have the feeling that it concerns a revelation that is less a moment of opening and relief than a sort of control or constraint, as if you didn’t want the image to exist, in the way a filmmaker would start a reel of film with the objective of only filming what happens between the exact beginning and the very first image. We’re somewhere in between, in a film that could be reduced to two photograms.” This idea of a film compressed into two photograms pleases me. The “inter-image” separating two photograms makes me think of a video recording in which Comolli evokes the place “of absence”6, the ghost element that haunts all film. Hearing him, you realize that the cinema carries in itself, physically, a great place of emptiness, that it is made through, or with, its absent part. You realize that an invisible film hides in every film. As Rodolphe Olcèse commented to me, it is perhaps this gap or lack, which is disappearing with the advent of the digital, that I seem to be replaying. In the same way that this system convokes the accidents, or lack of control, that the digital image tries to banish. In Eclipse, the swinging movement of the paper membrane troubles the plenitude of the illusion, interrupting our attention from the screen and breaking up the flow towards the depth of the image. The representation, this sensation of being cut off from the world, this ‘hole in life’, is disturbed by each beat of the hinge. Breaking up the continuity of the image may be nothing more, perhaps, than a way of bringing us back to the real (and to sensitize us to the frame and the ‘out of frame’.) In the long run, it’s the palpitation of the hinge that become the principal object of observation (and the image on screen its ‘hors-champ?’. To imagine a form of archeology of cinema is to move back to the moment when filming was a question of flesh. Flesh in the place of an avid and surprised response to the magic force of the projection, to the apparition of the image. The flesh of a gesture invoked by a desire for experimentation and a will to learn. To learn by doing. I realize that it is impossible for me to disassociate creation from a form of apprenticeship or re-apprenticeship. Constructing this installation means conducting a simple experiment, replaying the role of the operator-inventor who cobbles together his tools at the same time as he asks himself how he will use them. The shutter device grafted onto the camera lens is a crude counterpart to the internal machinery of the camera (and more generally of the device for cinematographic capture). It is almost as if it was the extraction of what, on the inside, makes the tool work. This extraction is a first projection. Compared to the internal electronics of the camera, this hand-made extraction is much less precise or sophisticated—obviously—which is why, I believe, it offers a form of weakened double. A little bit like a small model that shows an alternate counterpart to the real; this other version reinterprets, with a form of incompleteness, the camera-tool I use, freed from all organic knowledge. Derrida’s ‘désistance’8 intrigues me. I see a way of projecting oneself in a movement of retreat. To go out in the street and film a demonstration with no film (filmer à blanc), is to make contact with the world while exercising restraint. Integrating a crowd on the march so as to film it on the sly is, in a way, to enter into ‘desistance’. This relates, perhaps, to “the incompleteness of positions” that you evoked at the last Phantom Monday. ‘To The Distant Observer’ comes to mind, a text on Japanese cinema that evokes the first film projections that took place in Japan. Seats for these projections were sometimes positioned parallel to the lights of the projector, so that the audience could observe both the luminous beams and the image projected onto the screen. In this configuration, the spectator also adopts the point of view of the observer and situates himself in an incompleteness of positions. Not exactly a spectator, not exactly an observer, both distant spectator and ¾ observer, a person thus situated in a cinema sees the image arrive. He observes the cause at the same time as the effect. Sketch: a brick wall is built at the Espace Khiasma. It blocks the passage to part of the space—the ‘salle noire’ or black space used for film projections. This wall contains interstices, spaces between the bricks through which the rays of a projection filter. A title came to me for this beginning of an idea: Day. A film comes to us from this inaccessible reverse place. It filters in through the wall. It becomes a dissipative element, appearing bit by bit, disassociated from part of itself. Building this wall in the ‘salle noire’ will be like confining the room, but in fact, more like turning it in on itself. The projector will be moved and will be positioned at the exact opposite place from where it is now. The room’s orientation will change. The space, via its architecture, is occupying more and more place in the project and the wall becomes a recurring element: it allows for jumps and breaks in spaces, it can be the support for a projection or serve as shutter. It also allows us to regulate distance with images and screens. Day: this wall will perhaps be painted white, so that it blends in with the rest of the space. This fusion will redefine the space because it will reduce the total volume by about one-fifth. But I think this obstruction will actually open up the space. For in the same way that an amputation reveals a phantom limb, I suppose that removing the ‘salle noire’ will convoke its haunting. Removing this room from vision and the body will make it the ideal receptacle for mental projections, a space for suppositions. Another architecture, another place: this brick wall brings to mind the little structure in Demna. Abandoned, dilapidated and poorly constructed, the walls of the structure allowed you to see through cracks out on to the landscape beyond. 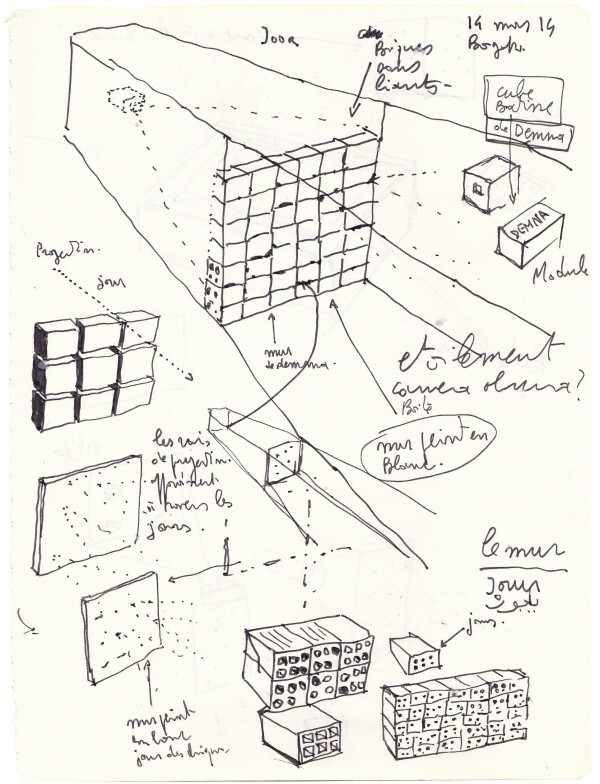 I see myself associating this architecture more and more to a box for writing and projection. Something here contains the kernel of the coming exhibition. The ‘salle noire’ at the Espace Khiasma could become a companion piece to the site in Demna. They are about the same size and I imagine have the same tendency for confining and opening. For the upcoming Phantom Monday, I’m currently making sketches on the blueprints of the Espace Khiasma. 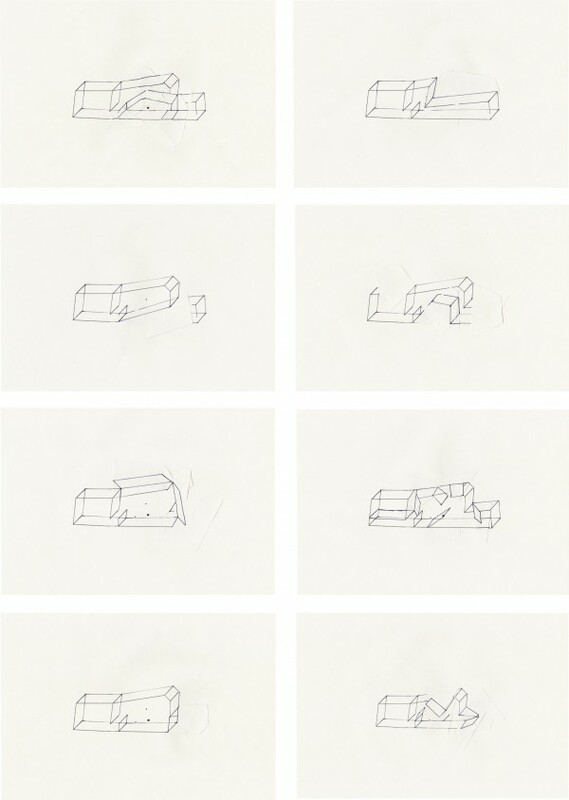 I sketch, articulate sections of wall, remove others and create holes in the plan. 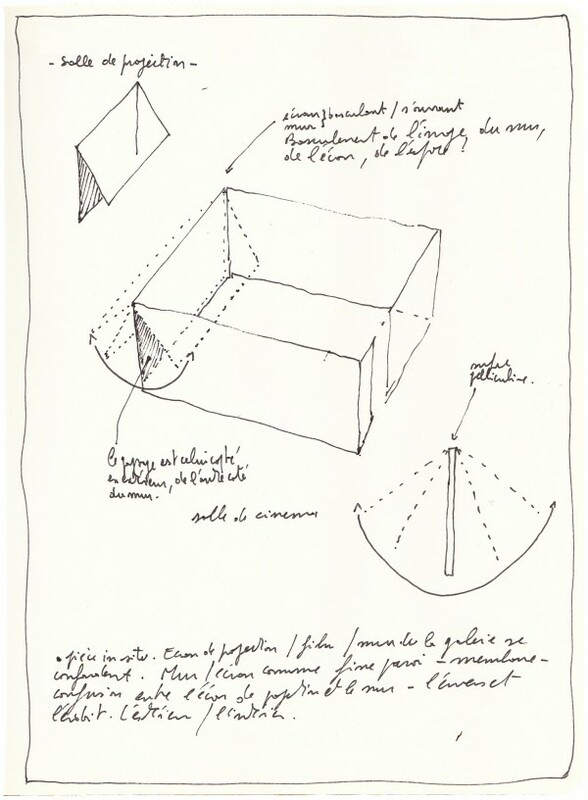 For the moment, I’m searching: this little drawing in three dimensions should be examined and unfolded the way you fold and unfold a box. Day, Eclipses, Apertures and Blank Film, but also Orientation, Ghost line and Attraction. All of these research projects are situated on the edges of perception, on the level of a “crest of visibility”. Eric Degoutte used those words. A crest of visibility that he registers in a ‘process of accommodations’ to things and to the real. Accommodation interests me because of the adaptation movement it supposes. I think that accommodation accompanies the passage from shadow to light, for example. A slow transition, the experience of the interval, the accommodation covers the precision effort, the adjustment to what surrounds it. It therefore presupposes a length: it’s the development of an attempt to see. Olivier, this discussion found its double on the day when you and I were considering the space at Khiasma, and you said the following about the September exhibition: “to manufacture a space to see”. By imagining all the different ways of transforming the space, the idea became more clear to me: to manufacture a place that serves to frame/re-frame, to open and close horizons. Aperture and Day: in both cases (but in a different way), the wall is associated with film, to the sensitized membrane. The wall becomes a torn, cracked screen, a permeable surface that lead to elsewhere(s). It is what separates as much as what links; an accommodation element between the real and the intercessor of the real to the image. I would like to include in the upcoming exhibition a work that is important to me, the video ‘One second of silence’ by Edith Dekyndt. 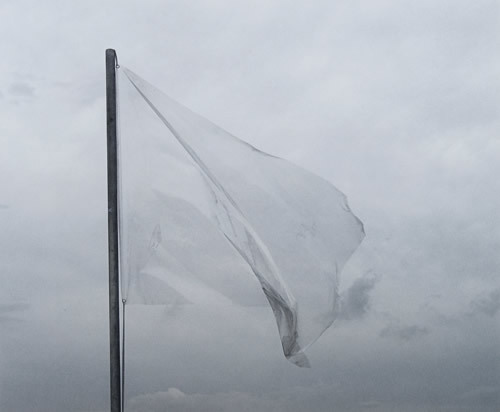 The video shows a transparent flag floating in the sky, waving in the wind. The flag works like a window in the image. The plastic material of the flag, flying over the landscape, catches colored and luminous nuances. Welcoming this video into the exhibition would be like creating another opening in the space, and drawing a precious horizon. ‘One second of silence’ is one of those pieces that I would have liked to have made, one of those works that I look at regularly and that I think of often. At a given moment, I said to myself that it could have been one of the possible outcomes of my current research, but in fact, it is more correctly one of its origins. This video has a place in what I am trying to do. It is part of a history in the same way that the gesture of welcoming it prolongs another gesture: that of Edith Dekyndt to Robert Dasché a few months ago, when she showed one of his films in her exhibition. My inviting Dekyndt’s video is the continuation of this gesture by another and for another. And within the gesture another dynamic attracts me: making visible. I want to continue this gesture because it participates in the creation of a ‘space for seeing’ that I dream of. In a different but similar way, it is in the same spirit that I invited you to join us in these exchanges, Cécile, and to participate in the next Phantom Monday. I wanted to invite you for several reasons. In part because as I watched you work (from afar), I appreciated your way of trying to maintain a long term work relationship with artists, which is rare. But also because at our first meeting, you spoke to me of the importance for you of composing your exhibitions in the manner of research. That is to say with an attentive follow-up of the artistic research in progress and attention given to the spaces and exhibition formats that are a result of that research. And it is this dynamic that I found in the exhibition you created with Guillaume Pinard for VANDALE. I believe that this discussion is one of the sparks of that project. I’ve noticed in my readings that film projection is often described as being a transport of an image. It might be better said that it is the transport of a doubt. Doubt is something that is beyond me, but I use the word because it engenders a relation to the enigmatic and the magical that touches me. It presupposes, in other words, creating a space that won’t reveal itself initially but will produce, in the period of accommodation, a floating or hesitation in relation to what is about to happen. I am clearly making a link here with the exhibition ‘Mandrake a disparu’, which tried to see the projection as the transport of doubts. I want to pull on this string from ‘Mandrake a disparu’ and use it as one of the themes for the upcoming exhibition.